"631.-Down the road towards Bridge, from Glen Iris." This photograph was taken looking south down the road towards the Glen Iris and Middle Falls. Through the mists in the distance you can make out the Portage Wooden Bridge. Originally this was the only road from the Dehgayasoh Creek bridge to the Glen Iris. Later changes would lead to two roads south of the main estate gates, one leading to the Middle Falls and the other to the Glen Iris and Fountain. 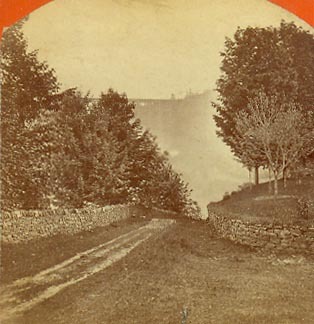 A view of the later, more westerly road, is also found in the historical photo album. To see some of the changes in the road system, it is interesting to compare the early 1860's plan of the Estate with a 1902 map. Note the stone walls -some of Mr. Letchworth's original walls are still preserved in the Park!